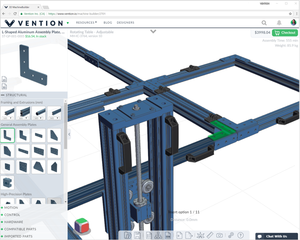 Vention.io — A New Cloud Based CAD Assembly Software You Should Check out Right Now! Vention.io — A New Cloud Based CAD Assembly Software You Should Check out Right Now! Brandon here back with a new post and I’ve really been looking forward to this one. In today’s post, I am excited to introduce you all to a great new company and to the even better idea/software that they have produced, Vention.io. Vention is a cloud-based machine builder & 3d assembly software that is completely free and requires no license, subscription or even an install! Allowing you to quickly and easily go from part selection and design to ordering and assembly of your machine in a matter of days. Sponsored this post and the accompanying video, helping support CADIntentions and the content I produce here. After using Ventions 3D Machine Builder for the last week or so I wanted to compile and share some of the features and benefits that I thought were really interesting and unique to their software. If you work with CAD to create machine designs, robotics, jigs, automation or any similar use, this app will be a perfect fit to incorporate into your regular workflow. Ease of Use: Whether you’ve used any other 3D modelling software or not I think pretty much anyone will be able to pick this browser-based software up quickly. If you do have a little experience or more then you will instantly feel at home with the modelling workspace. It’s easy to move around the building space with the mouse wheel to zoom/click to orbit and the right mouse to pan. Options like changing part lengths, additional movement and viewing connections can be accessed by a single click on a part. Embedded Part Library: This is where Vention really starts to stand out from the typical stand-alone modelling software. Not only are there 100s of parts built-in and available in the modelling app and each of them being available to be ordered instantly directly from within the builder when you’ve completed your design, but you can also shop for individual extrusions, plates and parts directly from the parts library, letting you get the parts you need for your projects quickly and easily. Real-Time Design: On top of each part in the builder clearly displaying its cost on the left above the part image, there is also a really helpful running tally in the top right of the workspace that keeps you up to date on the total cost of your parts, the approximate assembly time, and the total weight of the final package letting you make more informed decisions when choosing parts and the overall design of your project. Get your machine in days: Likely the most unique benefit, and to me the most innovative aspect of Vention and their machine building is the fact that it is literally a one-stop shop for designers looking to design, cost compare, order, assemble and start using a machine, robot, frame, workbench, jig etc.. in a matter of days. After you have designed your project using carefully selected parts that all work together, simply click through to the checkout page to see your final bill of materials including, Parts list, Unit Pricing, Quantity and Sizes. All you have to do next is fill out your shipping info, pay and wait excitedly to build your new creation in a couple of days. Vention even includes the hardware and Ikea style instruction needed to assemble your machine. That’s all for today post, as always thank you all so much for reading and let me know in the comments if you’ll be giving Vention a try and what you plan to build with it? Lastly, I wanted to Thank Vention.io again for sponsoring this post and helping to support CADIntentions.com and the content I make here!! Originally published at CAD Intentions.